What is the best lateral notch? V-notch? Flat bottom? What is the best way to cut the lateral? Here is one response given by Gary Schroeder to a comment on Facebook. There are many opinions as to which style is best, for the lateral notch. As in many approaches, experience brings in the need to improve on a style. In the log home handcrafting industry, more builders have moved away from a “v-notch” to more of a flat bottom or double scribed lateral. There are two reasons for such a move. The flat bottom leaves more wood to help prevent extreme checking and movement of the scribed edge outward from its intended seat. 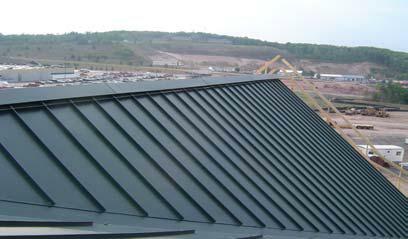 The double scribed lateral is even a more improved style. 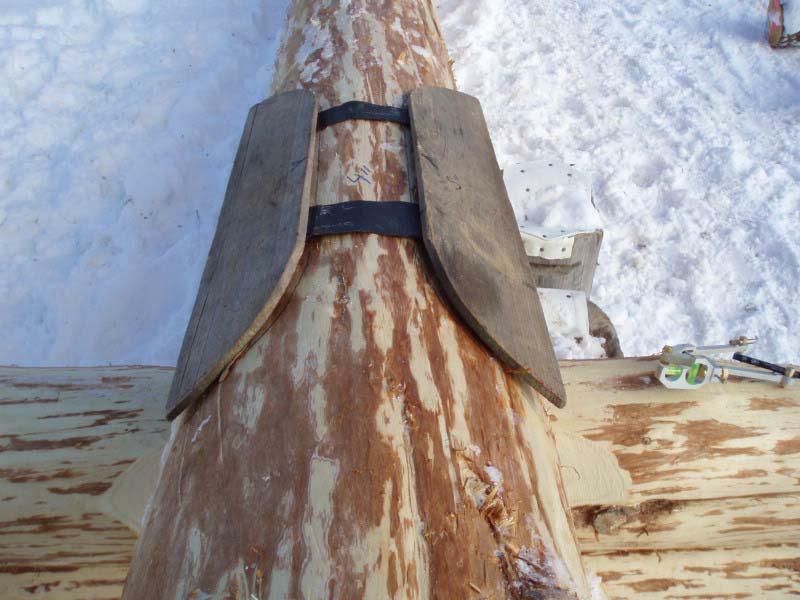 with two scribed lateral grooves: there is more wood left in place plus there is a notch at the top of the log to encourage checking,which helps to tighten the laterals. As there are more handcrafters, we will see additional improvements in older methods. Please share your opinions and perspectives on the best practice for cutting the lateral. I use cradles for all my one notch logs and find them very convenient for roughing down these pieces. It occurred to me that if I accurately drill the hole for the cradle in the right spot, I can use that same hole as the back of the door or window spline and save a little time when cutting keyways. As I leave 2” of trim in my openings, I layout my cradle holes about 6” back from the openings. The one inch Ø hole I use is just two saw cuts away from being a keyway. An early drawback I discovered is that the threaded rods of the cradles picked up and deposited sand (saw dulling sand) in these holes. The problem has been solved by making a rack for the cradles by drilling an off cut block and placing it on the ground near the opening. Cradles are put there when not in use and are easy to find. I also made up about 30 cradles when I made them so there is always a rack of them close at hand. The drill hole soon to be keyway also acts as a guide for the helpers on where not to staple when insulating and gasketing at restock time. The notching system I use has best been described as “scribing onto the scarfs.” Follow me through. The scarfs are layed out and cut at the same time as the rough notches and are scribed onto for the final scribe. To layout scarfs, I use a scarf saddle board. I made it from several scraps of 1/8” thick pine boards, 6” wide and fastened the two scarf shaped cutouts with 1-1/2” pieces of inner tube and staples. I bandsaw cut these out about 12” longer than the biggest diameter log I use on the project. The two pieces hang over the log with about a 4” gap between them. When cutting the scarfs, try to maintain at least a 4” width on top of the notch. This makes scribing easier because you don’t dip down on the scarf when scribing. This makes notching easier also because you can plunge cut out the bottom of the notch. 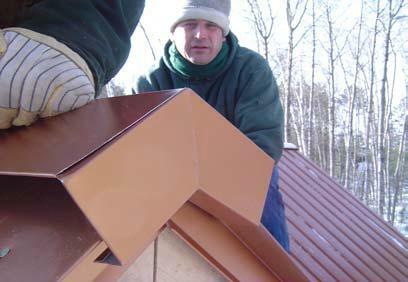 Mini-pro bars are made 2-1/2” wide and do that job nicely. Back to scribing the rough notches. For this job, I decided to use my tape measure body of approximately 1-1/2” thick as a scriber gapsetting tool. 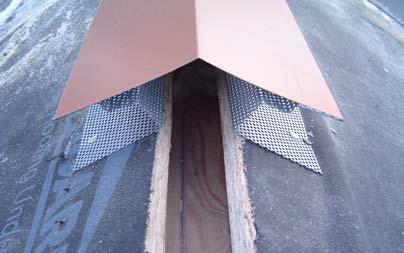 In use, the tape is laid on its side under the log to be rough notched inside near the notch. The scribers are opened up to the difference and you start your rough scribe lines. After scribing all the rough notches to within 1-1/2” of the log below, I take the logs down from the wall and cut the scarfs first. With the Cheveron in sight, this indicates the bottom edge of the scarf. When you sight the V shaped line, you easily can make that part of the log the horizon and with the saw cut accurately to the bottom edge of the scarf. On deeper scarfs, I often stop half way to check my cut. If not on or near my layout line, I restart the scarf cut. Time is saved by not cutting twice to achieve what 1or 1-1/2 cuts will do. The step cut in the off cut of the scarf saddle shows that you at least looked at the line. Plane and sand to finish scarf. If a lock notch or square notch is required for the log, I just stand the tape up and this will leave about 3-1/2” for a final scribe and enough wood for a lock. With the logs I use the 1-1/2” left inside the notch after rough notching usually means a final scriber setting of 2 – 2-1/2”. 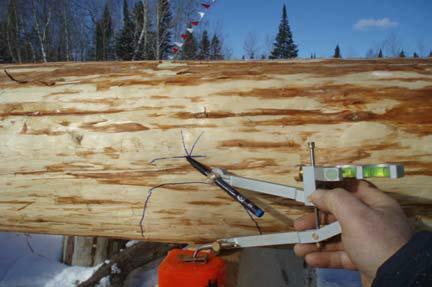 The taper in the logs then is what does the math of wall building and adjustments for log height is done by log selection rather than using scriber math. On some notch logs, this 1-1/2” gap means the log cradles are replaced by a 1-1/2” block near the door or window opening before final scribing. The “Twinsaw” from Craftsman can be a very useful tool. It has 2 circle saw blades that rotate in opposite directions minimizing the kickback tendency as the blades make contact with the material you are cutting. The two blades apparently have no set on one side as they are mounted very close together. I have found mine very useful in cutting wall slots and yesterday cutting off character post branches where they make contact with the stress-skin panels in the ceiling of the great room. After cutting, the sheet rock will be able to slide between the ceiling and the branch. As purchased, the Twinsaw has the blade guard retraction lever in the way for my purposes. I cut this lever off and attached a wire to form a finger loop to utilize for retracting the blade guard. See photo. Now that the lever is gone, I can lay the saw with this side on a flat surface such as the ceiling and move it into the branch and score the branch all around. I say score because the blade can only penetrate an inch or two before the saw body contacts the wood. Once scored, a reciprocating saw, handsaw, or electric chainsaw may be your saw of choice to complete the cut. As purchased, the Twinsaw cuts about 5/8‟s of an inch from the surface it is against. This gives plenty of room to slip ½ inch sheetrock. I have not tried 5/8 inch sheetrock. To utilize for wall slots, we have two options. The first is to make a jig to attach to the wall in the proper location for the wall and run the saw along it. 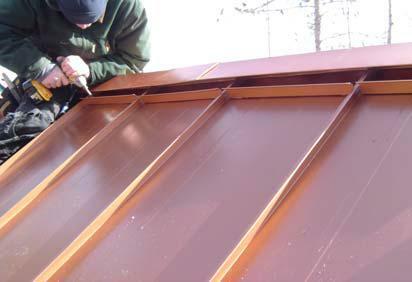 Use the saw to score the outside of the wall slot without any tear out of wood fibers. Then use the electric chainsaw to deepen and clean out the wall slot to its full width. I make slots for the sheetrock on each side of the stud, not for the stud itself. My first stud is plumb and against the log which protrudes the farthest. I may have to notch into one or two logs so my stud contacts at least one log high on the wall to receive the timber screw of some type. This screw goes into the top of a slot cut in the stud to allow for settling. It is put in only snug, not tight. I like to cut 3” squares of ¼” plywood to act as wooden washers so the screwhead or standard washer does not dig into the stud restricting settling. It won’t actually restrict setting. More likely it would break the screw. The Twinsaw needs more than one and ½ inch width to rest against so I add a stud for additional width or custom cut blocks between the jig and wall. 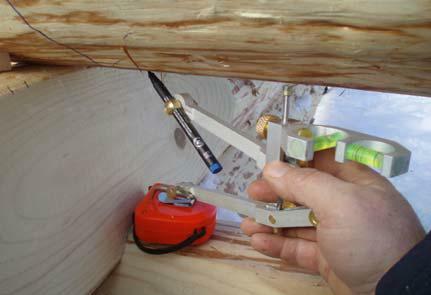 The saw may lose contact with the jig before penetrating the log without these blocks. The second option, which I prefer, is letting the homeowner (or me) frame the partition stud walls and use the end stud to guide the jig as mentioned above. It may still be necessary to add a stud or blocking. Another variation is having a pre-varnished trim board sit on top of the sheetrock. The advantage here is that slivers of unpainted sheetrock do not settle down into view over time. This recent house may be the first time I have done this. 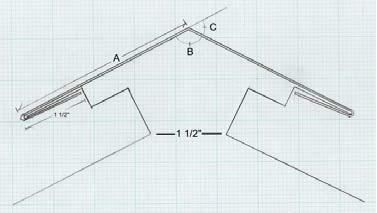 So this time I do not need a ½” slot for sheetrock, but a ¾” slot spaced ½” out from the framing. In theory, if I temporarily screw a 5/8” thick plywood to the framing to guide the Twinsaw, the outside of the scoring saw kerf should be at 1 and ¼”. Just right for the ¾” wood on top of the ½” rock. Actually I aim for at least 1/16” oversize; otherwise you will be cussing as the material will not go into the slot. The depth of the wall slots is always a question. Ideally, the slot would go in to just make contact with the lateral groove thereby closing all gaps. Going too deep reduces the structural integrity of the logs sideways strength. There should not be two slots on opposite sides of a log at the same point as this would really reduce this integrity. This depth of the slot would be easy in the rare situation where all the laterals are 4” wide and are in perfect alignment. That does not occur in my houses with character (crooked) logs. So sometimes my sheetrock ends are not cut square. If they are not square, I have to ensure that after settling there will not be an absence of sheetrock at the lateral groove. It takes a little figuring for me to be sure the sheetrock goes straight up from each lateral groove at least as far as I expect that point to settle down. With the trim board on top of the rock, that board could be removed later and corrected, but with the sheetrock you are kind of stuck! Another place for sprayfoam, trim it, sand it, and paint it. That would work in my house, but not for my customer! Of course, everyone knows that if the sheet rock is scribed with points to go in between the logs, those points can eventually break off as the logs settle. Some people think after a year or two the house is done settling. Myself, I estimate my houses settle to 80% in three years. I know of two log homes within 20 miles of mine that had settling occurring at 12 years. I find this hard to believe but the homeowners told me first hand. One of them was a log home builder also. Both of these homeowners came home and could not open the door because the settle board had come down enough to interfere with the door opening. Now this is a cut and dry situation. Either the door touches the settle board or it does not touch. So at 12 years of age, two log homes still had settling occurring. One was smaller red pine logs by our standards, but the other was probably 12” mid-diameter logs. I actually spent a week fitting logs on that house when it was built in 1982 and put an addition on it several years ago. Now they want more room again and I talked to them about another larger addition. Another variation is wall slots for ¾” material such as pine tongue and groove. For this, I added a spacer onto the saw metal housing around the blade. This entailed drilling and tapping the thin metal for screws to attach the aluminum material I used for my spacer. I could see duct tape being used here!! Yesterday I removed my spacer since the plywood on the framing gave me more spacer thickness which I needed. I recently purchased two “DUAL-SAWS” from the TV infomercial. I was sure they would work great. And the first one did for a while. On TV they even cut a car body in quarters. Cutting brass and aluminum requires the use of a lubricant stick which looks like a hot glue stick. Anyway, this 3amp saw worked for a few slots, but got hot with the continued use. Five minutes to cut a slot, 10 minutes to set up for the next, and so on. It started to smell like a hot motor. A couple days later 5 minutes cutting a window (2‟x4‟) extension jamb down and it quit running. The craftsman is 7 amps. I have to remember to give it sufficient cool down time! I may have paid $189 at Sears 4 or 5 years ago after Jim Grieb showed us his Craftsman Twinsaw at a conference. Several years ago, I made a simple 6” by 12” rectangle out of some aluminum flashing stock in order to lay out some 6” by 12” mortise and tenons that I had to cut and since then it has been called, “The Thin Tin Shim.” It gets used quite a bit for many more uses. It is called for to lay out lock notches, transfer square end cuts around a log from chalk line centerlines, floor joist mortise and tenon layout on wall logs and to square end log floor joists. 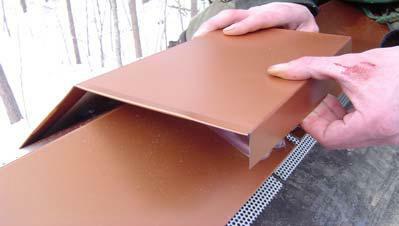 It can also be used as a gauge to check widths of cuts. I also bend it over under hanging log ends when finish scribing the coved ends of a log. 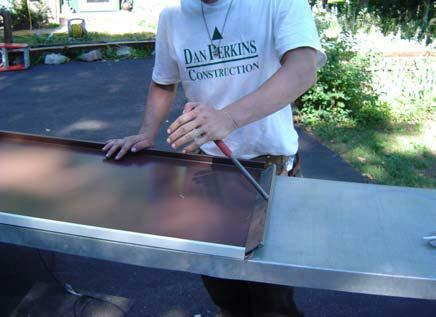 The flashing stock is easy to accurately cut with a utility knife and small nicks with the knife mark the center lines all sides. It is now very easy to pick up and transfer a 3” or 6” offset to cut a center line or snap line, layout square cuts on log ends or work off the center of a notch to layout a 6” wide lock notch. Then wrap around the log below at the double scribed notch to quickly lay out the female part of the lock. This flexible free mini square has many redeeming features. It can be left out in the rain and never rusts. It never seems to get lost or left behind. I have been using the same one for years.